If it’s good enough for Liverpool FC it ought to be good enough for Peterborough United. Style, quality and entertainment can go out of the window at this stage of the season as long as you win. Drag the season out as long as possible and see if superior sides falter under the pressure. Posh goalkeeper Aaron Chapman makes a save in the 2-0 win over Gillingham. Photo: Joe Dent/theposh.com. An ultimately comfortable 2-0 win over Gillingham at the ABAX Stadium yesterday (April 6) means Darren Ferguson’s men have now won back-to-back League One matches for the first time in over five months and now kept back-to-back clean sheets for the first time all season. With stats like that it’s a minor miracle Posh still retain hope of extending their season beyond the next six matches, but, even though any neutral watching the last two games wouldn’t believe they were witnessing serious promotion candidates, the table tells a different story. Doncaster, who have a far friendlier run-in, remain hot favourites to secure the final play-off spot, but the fact Posh are still in their fighting in April represents progress on recent campaigns. They’ll need to improve though as five of their remaining six matches are against top-half teams including two against bang in-form automatic promotion candidates Sunderland and Portsmouth when this new-found defensive security will be given a stiffer test than Southend and now Gillingham have managed. “We could have played until midnight and we wouldn’t have scored,” Gills boss Steve Lovell conceded afterwards. “Credit to Peterborough as they defended very well and nullified our threats. Posh substitute Josh Knight battles for possession with Brandon Hanlon of Gillingham. Photo: Joe Dent/theposh.com. 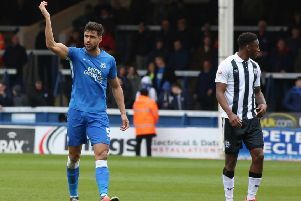 There was a time under Ferguson when Posh tributes were all about their attacking quality, but the boss has tried to adapt to the strengths of the players he’s inherited as much as they have had to respond to his preferred style of play. The result is a mix of no-nonsense, safety-first defending while hoping a front four that looks fearsome on paper can click often enough to win matches. It’s worked for two games, but the passing accuracy into playmaker Lee Tomlin as well as striker Ivan Toney’s general play will have to improve in coming weeks. After a poor first-half Marcus Maddison’s penalty - his 50th goal for the club - and substitute Matt Godden’s well-worked and well-taken late goal secured these points. Posh started the second half with a much better tempo and once in front they kept a forward line that troubled league leaders Luton at Kenilworth Road recently pretty quiet with centre-backs Rhys Bennett and Ryan Tafazolli in terrific form. Siriki Dembele won the Posh penalty - ‘the refereee got one decision right,’ Ferguson, who was booked by off-form Championship referee Rob Jones for complaining once too often, said - and his pleasing return to action was as comforting as watching lanky goalkeeper Aaron Chapman leaving his line to catch some high balls. Theoretically Dembele’s extra pace should be a bonus, particularly in the four remaining away matches. It was all watched by another bumper crowd full of youngsters admitted free of charge, although they probably weren’t the ones taunting 20-goal Gills striker Tom Eaves by cruelly comparing him unfavourably with another cumbersome centre-forward with a ponytail, Andy Carroll. 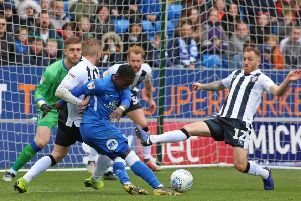 The same Posh fans also turned on former player Leo Da Silva Lopes whose performance again emphasised the genius of Barry Fry in persuading a Championship club to splash out close to a million quid on a midfielder with a questionable work ethic. Posh: Aaron Chapman, Jason Naismith, Daniel Lafferty, Rhys Bennett. Ryan Tafazolli, Alex Woodyard, Louis Reed (sub Josh Knight, 82 mins), Siriki Dembele, Lee Tomlin (sub George Cooper, 76 mins), Marcus Maddison, Ivan Toney (sub Matt Godden, 65 mins). Unused substitutes: Conor O’Malley, Tyler Denton, Callum Cooke, Matt Stevens. Gillingham: Tomas Holy, Luke O’Neill, Connor Ogilvie, Max Ehmer, Barry Fuller, Mark Byrne (sub Regan Charles-Cook, 25 mins, sub Billy King, 90 mins), Leo Da Silva Lopes, Dean Parrett, Graham Burke (sub Elliott List, 80 mins), Tom Eaves, Brandon Hanlon. Unused substitutes: Tom Hadler, Alex Lacey, Josh Rees, Roman Campbell. Goals: Posh - Maddison (pen, 58 mins). Godden (86 mins). Cautions: Posh - Toney (delaying the restart), Maddison (foul), Ferguson (dissent).